The following article entitled 'A Shorter History of the Regiment of Colonel Robert Hammond of the New Model Armie' was prepared by our original Regimental Ensign, Mark Cooper; with later amendments by Jon Courtney-Thompson Officer Commanding. 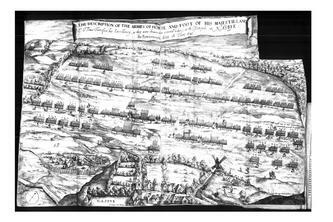 Colonel Robert Hammond's Regiment, Battle of Naseby 14th June 1645. 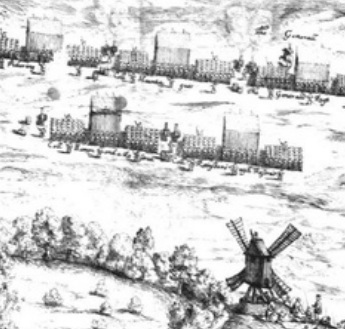 With the formation of the New Model Army in the winter of 1644-45, the unit originally intended for the Scots Major-General Crawford, was given to Robert Hammond, newly promoted to Colonel. Born in 1621 to a distinguished family with lands in Chertsey, Surrey, Hammond was a fascinating character in his own right. After education at Magdalen Hall, Oxford, he left in 1636 without taking his degree and entered the army serving in both the Scots and Irish campaigns of 1640-42. He first distinguished himself at the storming of Camickmain by leading an assault on the breach after the death of the Regimental Commander Sir Simon Harcourt, and overcoming the defences, whereupon he 'carried himself very gallantly'. Hammond's bravery in battle is remarked upon many times in his career. His second-cousin, Oliver Cromwell, wrote to him in 1648, 'thou hast naturally a valiant spirit' - no small praise indeed! In the Civil War, Hammond was first a Captaine at Hull under Sir John Hotham, then Captain-Lieutenant of Essex's Lifeguard with whom he defeated a party of 400 Royalist horse at Bicester on the 31st August 1643. Receiving his Majority soon afterwards, Hammond was appointed to Colonel Massey's Garrison Regiment of Horse at Gloucester and led the party of Parliament troops that captured Tewkesbury. Soon afterwards he killed a brother officer in a duel over a point of honour, but was unanimously acquitted on the 28th November 1644 by a London Court-Martial who gave a verdict of self defence. This then was the man appointed to a command in an army upon which in 1645, the hopes of Parliament rested. Despite the defeat at Marston Moor the previous year, the King's Army still remained a potent and dangerous force, well officered, with veteran troops and numbering as a field force around 12,000 men. Captaine Edmund Rolfe (Garrison Company at Carisbrooke - Rolfe was promoted to Major by Hammond). The New Model Armie's trial of strength came on the 14th June 1645 on the field of Naseby, where the King's forces under Prince Rupert of the Rhine, and Jacob Astley were comprehensively defeated. Never again were the Royalist forces able to bring together an army of this quality and numbers. Hammond's Regiment was in the second line of infantry and when the units to their front were pushed back by the seasoned Royalists, they 'repelled the enemy, forcing them to make a disorderly retreat'. The series of sieges and stormings that marked the end of the First Civil War heavily involved Hammond's unit, and they rapidly gained a reputation for tenacity and bravery. Basing House - Hammond was captured here, but released after storming. With the ending of the war, Parliament then turned to the ever present problem of Ireland. 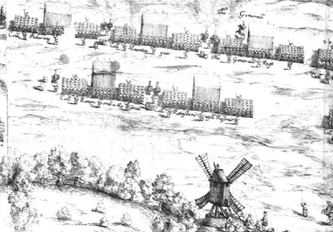 In the spring of 1647 it was proposed that Hammond should secure Dublin with his and Herbert's Foote until reinforcements could be sent. However, quarrels between the New Model Armie and Parliament had come to a head and Hammond's veterans marched to join the rest of the Army at the point of embarkation in Cheshire. Although Hammond represented his men as willing for Irish Service, the regiment was torn by division. Captaine O'Hara, six Lieutenants, several Ensigns and 400 men were not willing to go to Ireland and drew off from the main army. These men were never to rejoin the Regiment, and O'Hara was replaced by Captaine Francis Wheeler. The political upheavals in the army approache armed insurrection, the men still led by the majority of the officer corps, marched towards London, and despite calls of the radicals to march on Parliament, restore the Monarchy and redress personal grievances, Hammond's Regiment appears to have behaved throughout with discipline and relative submission. After the Putney Debates in November 1646, Hammond, dissatisfied by the activities of the army 'desired retirement...and the thought of quiet on the Isle of Wight'. Isaac Ewer 'a former serving man', took command of the Regiment on the 1st September 1647. In the Second Civil War in 1648 the unit was most active. Initially serving with Oliver Cromwell in south Wales, Ewer was appointed to the taking of Chepstow Castle by storm on the 25th May 1648, and them marched to join Sir Thomas Fairfax besieging Colonel Lisle and Colonel Lucas inside Colchester. After the fall of the town, Ewer was one of the Commissioners responsible for the execution of the two Royalist Commanders. In the meantime, Hammond had his quiet backwater on the Isle of Wight suddenly and dramatically disturbed by the arrival of the King, who had escaped from Hampton Court. On the 13th November 1647 Hammond reported to Patliament the whereabouts of his Majesty and for the next year had the unenviable task of confining Charles, although in reasonable comfort. It would appear that Hammond had a good deal of sympathy for the King, shown in the lassitude Charles was allowed, the two men often dining together. Nonetheless, Hammond foiled several escape and rescue attempts, and two additional companies of his old regiment were detailed to the guard at Carisbrook Castle. These were the companies of Humphrey and Wheeler. Part of the existing guard was formed by Rolfe's Company and their commander was promoted to Major by Hammond who described him as 'an honest, faithful and careful man'. The decision to bring the King to trial resulted in Hammond receiving orders from the Army to more closely confine the King, preparatory to transfer, but without the direct orders of Parliament, Hammond refused to obey. He was therefore ordered to Farnham Castle and arrested. Colonel Ewer leaving the garrisoning of Portsmouth with his Lieutenant-Colonel, Robert Saunders, arrived at the Isle of Wight to be the new Governor. Two days later the King was moved from Carisbrook Castle to Hurst Castle on the first stage of his inexorable journey towards martyrdom. Ewer appears to have sat in judgement of Charles and his signature appears on the Death Warrant. Ewer, the Regicide and his unit now reunited, were chosen by lot to go to Ireland on the 30th March 1649 and this time obeyed without question. Following Cromwell, the regiment lost heavily at Drogheda, where it was Ewer bringing up reinforcements that stormed the breach to carry the city. Cromwell himself records 'Ewer having two Field Officers in his regiment shot', one of these being Captaine Israel Smith. The regiment also served at Kilkenny, Clonmel (where Captaine Humphrey was killed), Carlow, Waterford and Limmerick. The by-now battered unit marched to Kilkenny on the 31st October 1649 to winter quarters, and Ewer probably died at Kilkenny during the winter of 1650-51, most likely of the plague. This spared him the fate of the other regicides at the restoration in 1660, although some property he had acquired in Essex was confiscated.